After climbing up the remaining structure of the main stairwell, you find yourself in what would have been the Tower’s Great Hall. Now, of course, it is completely open to the elements, including the floors above. We produced a calendar for 2017, which was sold this year; at the Clan Gathering, to members visiting Sorbie Tower and via website and e-mail orders. The proceeds from sales were donated to the Sorbie Tower Restoration Fund. We are intending to produce a calendar for 2018. The aim is to have these available for sale at the Gathering in May 2017, and after this by mail order; by purchasing online or ordering by post / e-mail. We will be placing a deadline for last orders being placed and paid for by the end of October 2017. We want to give all our members the opportunity to purchase calendars, especially those who will not be fortunate enough to attend the gathering, and those without the internet facility with which to order. We are unable to include this item in the Clan Goods List because; they will only be available at a certain time, we need to satisfy orders without surplus unsaleable stock at the end of the year, and because of varying postage rates – depending on the destination and the quantity ordered. If you are interested in purchasing one or more calendars, please either check the website in June 2017, or contact our Secretary Jacquie. If you would like to pre-order before June, please contact Jacquie to place an advance order. Do you shop online? 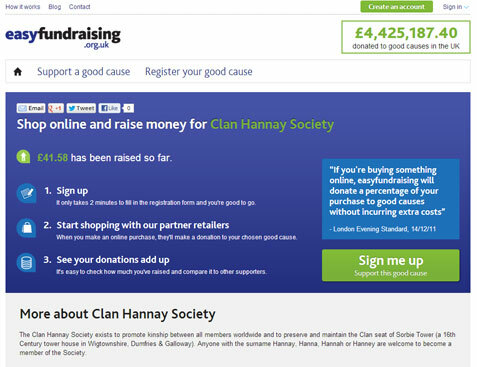 Purchases made through a partnership with easyfundraising.org.uk will direct a donation to the Clan Hannay Society. Find out more here. Currently, this organisation supports only causes in the United Kingdom, and only UK residents are eligible to sign up. It works in a similar way to many other loyalty shopping sites, but instead of earning points when you shop,you raise a donation for your cause instead. It’s as simple as that! Want to help with the restoration of Sorbie Tower? Can’t make it to the 50th anniversary gathering, but want to contribute to the Society in some way? In response to queries from members about donations for work on our ancestral keep, here’s the info you need. Our Clan seat, Sorbie Tower, is in urgent need of restorative work, and I am approaching all members for help towards this work, by donating £50 (but any amount will be welcome) in this 50th year. If every member gives £50, we could create a fund in the region of £25,000, which would be a good start towards our goal of achieving a full restoration. The names of those donating £50 [or the equivalent in other currency] or more will be entered in a special donations book, and each will receive a certificate. I hope to see you in Scotland in May. 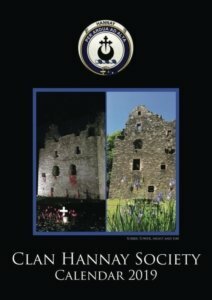 To make a donation, please send a cheque made out to The Clan Hannay Society, and write in the memo field – or enclose a brief note – indicating that it is intended for the Sorbie Tower Conservation Project. See below for the appropriate mailing address based on the currency used. Clan Hannay welcomed for the first time the Sealed Knot Society’s Manus O Cahans Regiment on Sat 16th and Sun 17th April 2011. The society’s members are working with the clan to raise funds for the restoration of the tower. Stephen Hanna, our resident Sorbie Tower Guide, would like to thank all visitors to the tower — members and non-members alike — for being so generous with their donations. The amount given so far from tours stands at around GBP1,500.00 ($3,000) over a period of two years.